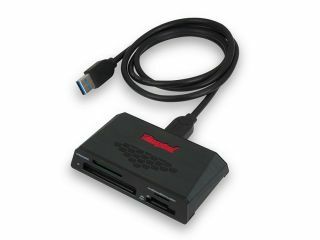 Kingston has announced a new USB 3.0 multiple card reader. The reader takes advantage of the fast speeds offered by USB 3.0 technology, which allows for quicker data transfer times. Multiple card formats are supported by the new reader, including the newer high capacity cards, SDXC. While many computers now come with inbuilt card readers, they're not always compatible with new formats such as SDXC which have been designed to meet the need for extra large files. SDXC cards are typically used by cameras which can shoot HD video and require very large file sizes. Delivering up to 5.0Gb/s data transfer speeds for high resolution images and large data files, the reader is aimed at serious enthusiasts who need quicker data transfer speeds. The card reader is also backwards compatible with USB 2.0. A three-foot USB 3.0 cable is supplied with the product, which is also backed by a two-year warranty and 24/7 tech support. Other cards that can be read by the reader include CF Type I and II, SD, SHDC, micro SD and micro SDHC/XC, Memory Stick, Memory Stick Pro, Memory Stick Duo and Memory Stick Pro Duo. Kingston is the world's largest independent manufacturer of memory products, with headquarters in the U.S.